INDIANAPOLIS — A local nurse has developed a medical device to help people with sickle cell disease, thanks to expertise from the Indiana Clinical and Translational Sciences Institute (CTSI). Abi Huskins, a PRN nurse at Indiana University Health and the mother of a 7-year-old son who has sickle cell disease, worked with Jon Merrell, MD, director of the Indiana CTSI’s Clinical Care Innovation Accelerator, to find a way to solve a problem she noticed during the course of her son Ivan’s treatment. Sickle cell disease is an inherited blood disorder that causes red blood cells to become misshapen (like a sickle), slowing and blocking the cells from delivering blood and oxygen to different parts of the body. As part of Ivan’s treatment, he must get regular apheresis therapy, which involves removing blood through a needle or catheter, replacing his damaged red blood cells with donor cells, and circulating the donor red blood cells back to the patient with the other blood components through a return needle. 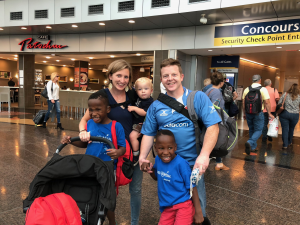 It was during this therapy that Abi noticed Ivan’s new port site––a special entry point for the needles––didn’t provide him the traditional standard of care, which she knew called for a more enclosed, transparent cover during the transfusions. Abi heard about the Indiana CTSI’s Clinical Care Innovation Accelerator from her husband, who had recently attended one of Merrell’s presentations, and she quickly reached out to Merrell about what she could do to start working on a solution. With Merrell’s help, Abi has invented a clear, enclosed cover, which she has dubbed Guard-a-Port, to protect Ivan’s port site. She developed prototypes, first, with Play-doh and then with help from mechanical engineering students at IUPUI, who used a 3-D printer to produce a plastic version of her design. Then, Merrell worked with local vendors to 3-D print a the clear version they have today. Abi and Merrell are currently working on ideas for how to bring the new medical device to market. Are you All IN for Health? Did you know that Indiana is 41st in the nation in overall health, according to the 2018 America’s Health Rankings report? The Indiana CTSI and the IU School of Medicine have both declared bold goals of improving our state’s health – and quickly! As part of this effort, the All IN for Health program was created to engage the Indiana public in conversation about health research, simplify and debunk myths about participation, and build a statewide registry of research-ready volunteers. With your help, we can reach more people and be more impactful in our work. Be part of the conversation! Visit All IN for Health’s website to join our online community. Share what’s important to you, and don’t forget to invite a friend or family member. Together, we can improve the health of Indiana! Questions about All IN for Health? Interested in contributing to our blog or health resources? Want to feature your research efforts, or need help recruiting volunteers? Contact Jessica Hall at jesmhall@iu.edu. 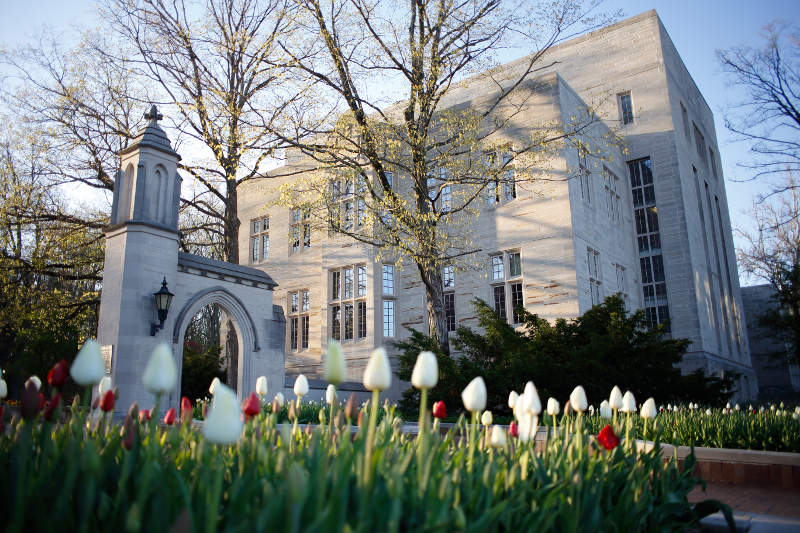 Don’t miss the Indiana CTSI’s annual Bloomington retreat April 24 at Indiana University. This year’s event will focus on research-based solutions for addressing obesity in rural Indiana. Our Community Health Partnerships program has formed a new alliance with the Indiana State Department of Health. We will support the statewide health coalitions in their efforts to improve health across Indiana. The Indiana CTSI is sharing evidence-based research, including a podcast featuring an interview with co-director Sarah Wiehe, to help Hoosiers stop smoking. The Indiana CTSI has partnered with the Jackson Laboratory to offer exclusive pricing for mouse model generation services to researchers at IU, Purdue and Notre Dame. Tommy Sors, Indiana CTSI research navigator for Purdue University, has been named to the Big Ten Cancer Research Consortium Steering Committee. Indiana CTSI-supported researchers are recruiting people of all ages and health conditions to participate in a study to advance understanding of bone and muscle disorders. The Indiana CTSI’s annual Career Development, Education and Research Training Programs (CERT) retreat was held January 14, 2019, in the Health Information and Translational Sciences building in Indianapolis. Led by Aaron Carroll, MD, MS, director of CERT, 14 faculty leaders attended the retreat, representing several CTSI programs focused on career development, education and research training across Indiana. Each year, the retreat provides an opportunity for the CTSI’s education leaders to get together and review progress toward goals, to leverage strengths across the various programs, and to identify areas for improvement or gaps in learning for trainees. According to Patty McGuire, CERT program manager, the retreat focused on progress toward 2018-19 deliverables, including the development of new training opportunities for KL2 Scholars, a grant writing seminar series, a population health workshop, and a workshop on communicating science to the public––all three of which will be piloted this winter. The mission of CERT is to support students, staff, fellows, faculty, and other stakeholders through educational and training experiences necessary to ensure a continuous pipeline of highly qualified and successful clinical and translational science researchers. View all open funding opportunities or update your Indiana CTSI email preferences to receive our funding-specific email alerts.